In a paper published in Astronomy & Astrophysics, a team of researchers from the Instituto de Astrofísica e Ciências do Espaço (IA3) discovered observational evidence for the existence of two distinct populations of giant planets. So far, more than 3500 planets have been detected orbiting solar-type stars. Although recent results suggest that most planets in the galaxy are rocky like Earth, a large population of giant planets, with masses up to 10 or 20 times the mass of Jupiter (itself 320 times the mass of the Earth), was also discovered. 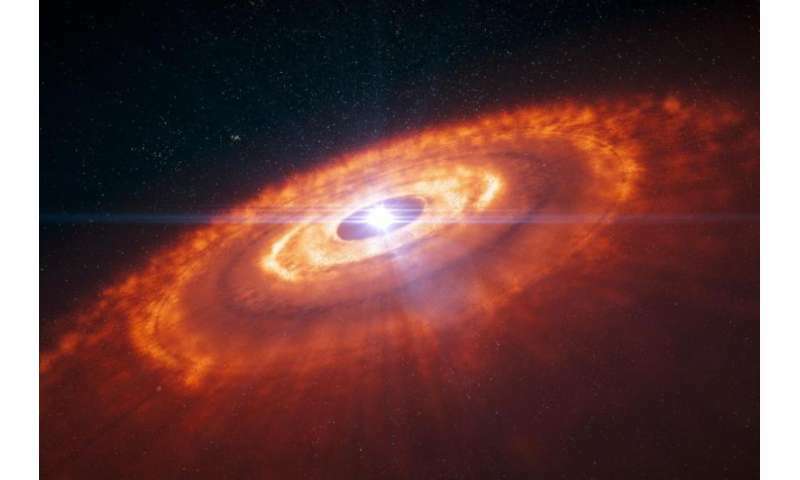 A large amount of the information about how these planets form is coming from the analysis of the connection between the planets and their host star. 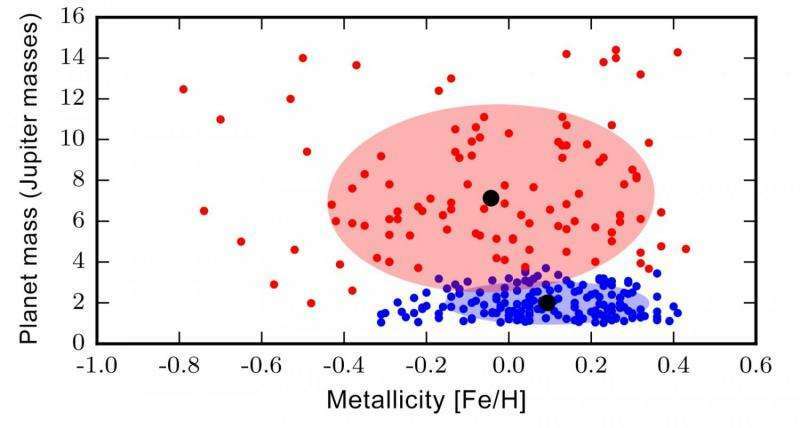 Initial findings have shown, for example, that there is a tight connection between the metallicity of the star and the planet occurrence or frequency. Stellar mass has also been suggested to influence planet formation efficiency. State-of the art models of planet formation suggest that two main avenues exist for the formation of gas giants. The so called core-accretion process holds that first, a rocky/icy core forms, which draws gas around it, eventually resulting in a giant planet. The other suggests that instabilities in the protoplanetary disk5 can lead to the formation of gas clumps, which then contract to form a giant planet. Vardan Adibekyan (IA & Universidade do Porto) says, "Our team, using public exoplanet data, obtained interesting observational evidence that giant planets such as Jupiter and its larger-mass cousins, several thousand times more massive than the Earth (of which we do not have an example in the solar system) form in different environments, and make two distinct populations." While objects smaller than about four Jupiter masses show a strong preference for metal-rich stars, in the four to 20 Jupiter-mass range, host stars tend to be more metal poor and more massive, suggesting that these massive giant planets form with a different mechanism than their lower-mass contemporaries. Nuno Cardoso Santos (IA & Faculdade de Ciências da Universidade do Porto) says, "The result now published suggests that both mechanisms may be at play, the first forming the lower-mass planets, and the other one responsible for the formation of the higher-mass ones." 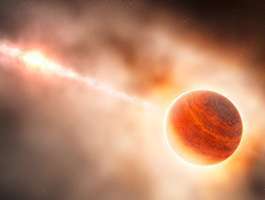 The lower-mass giant planets seem to be formed by the core accretion process around more metal-rich stars, while more massive planets seem to be formed mainly through gravitational instability. Adibekyan says, "Although this discovery was a large and important step toward a complete understanding of planet formation, it is not the last and final one. Our team will enthusiastically continue addressing many open questions." Observations with GAIA (ESA) may shed some light into this. In the near future, missions like ESA's CHEOPS and PLATO, or NASA's TESS, which will allow for the study of mass-radius relation, along with studies of their atmospheric composition using instruments such as ESO's ESPRESSO at the VLT and HIRES at the ELT, or the James Webb Space Telescope (JWST), may also bring new constraints about the processes of planet formation.